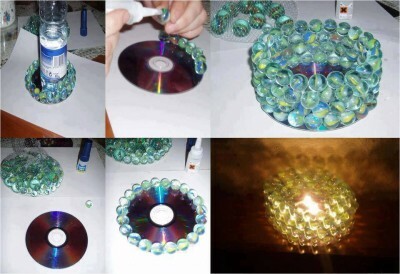 If you have some used CDs or DVDs and some marbles, this awesome candle holder project is worthwhile to try. Use the CD as the base and glue the marble along the edge. The beauty of the final product is that the light pattern is very cool. One Response to "How To Make Awesome DVD Marble Lighting"
what kind of glue do u use ?